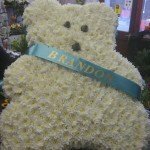 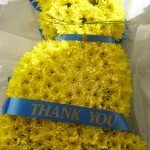 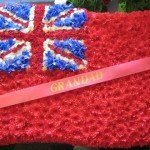 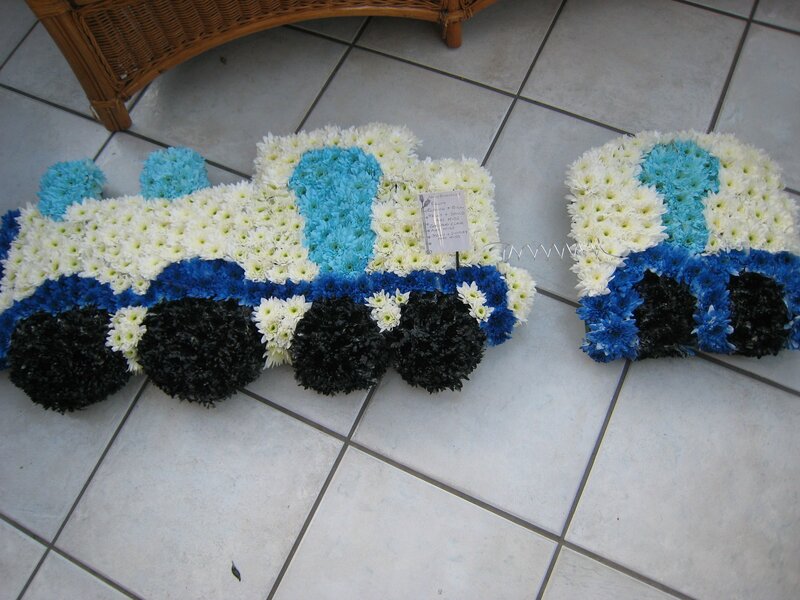 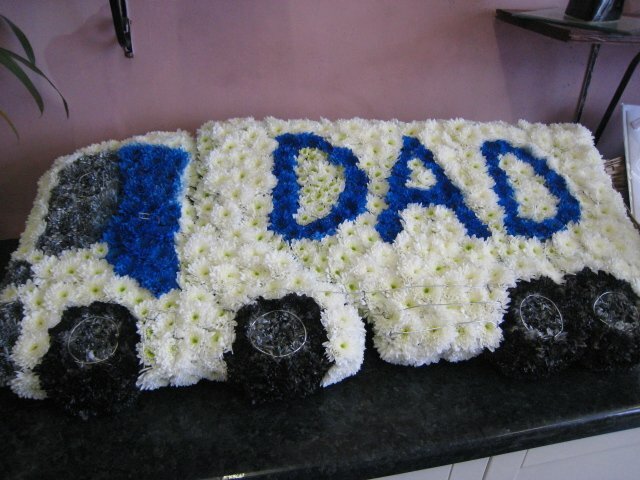 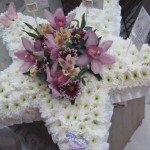 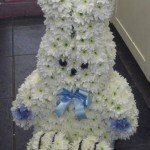 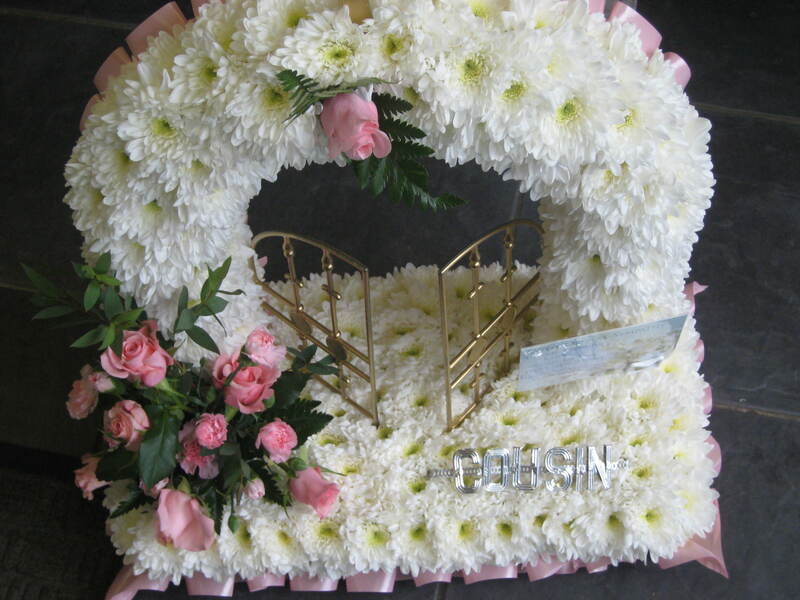 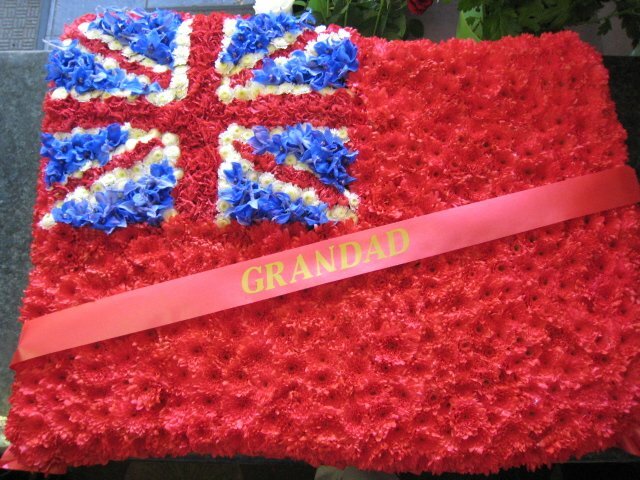 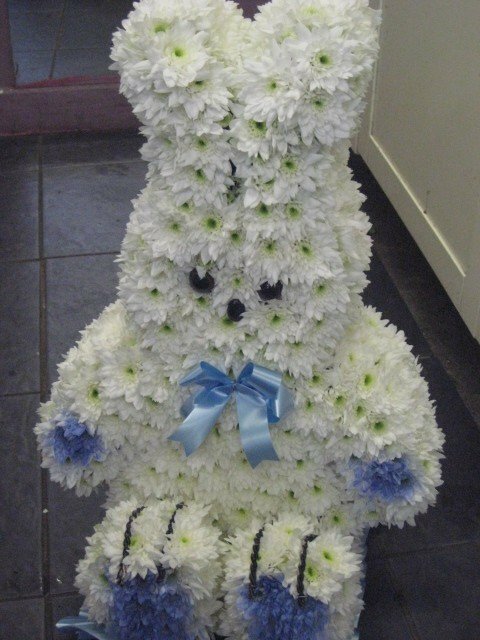 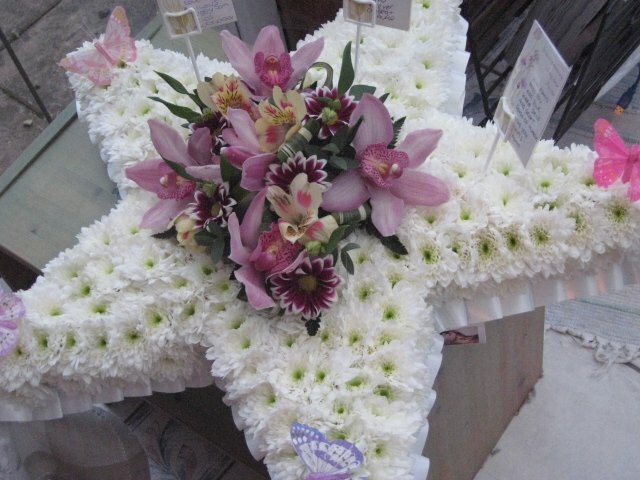 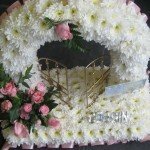 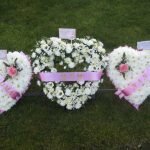 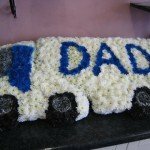 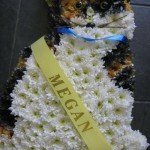 These funeral tributes are a small selection of designs we have made for our customers. 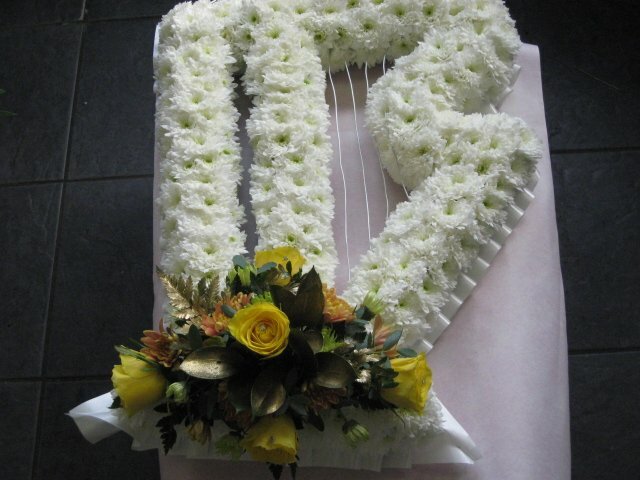 we will be only too happy to advise you on your personal tribute. 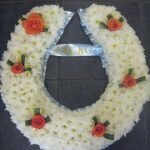 As each invididual piece is crafted by hand, please give us at least 48 hours notice so that we may design your personalised tribute. 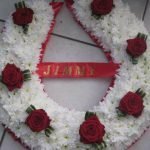 Some designs need to be ordered from our wholesaler and can take up to 4 days to arrive or others are bespoke handcrafted designs, so the sooner you can let us know your requirements the more likely we are to get the tribute. 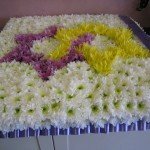 A very popular arrangement depicting the gates of heaven made in chrysanthemums with a spray of flowers to one side of the gates. 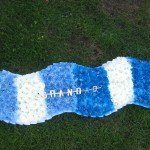 Ribbon edged and a Ribbon banner of lettering can be added. 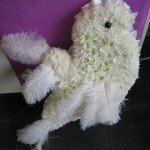 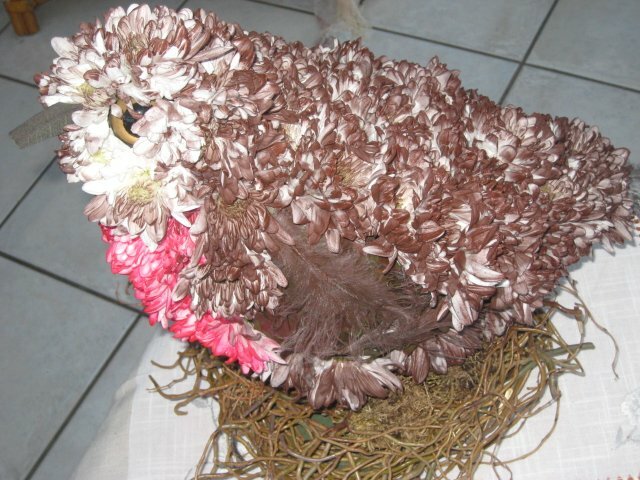 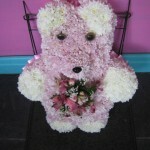 Can be made in white, pink or yellow chrysanthemums and a your choice of spray. 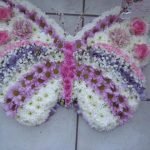 This butterfly was made with orchids around the edge, spray carnations, cerise roses, cool water roses, white spray roses, gypsy and mini gerbera. 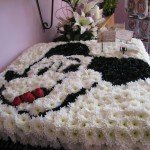 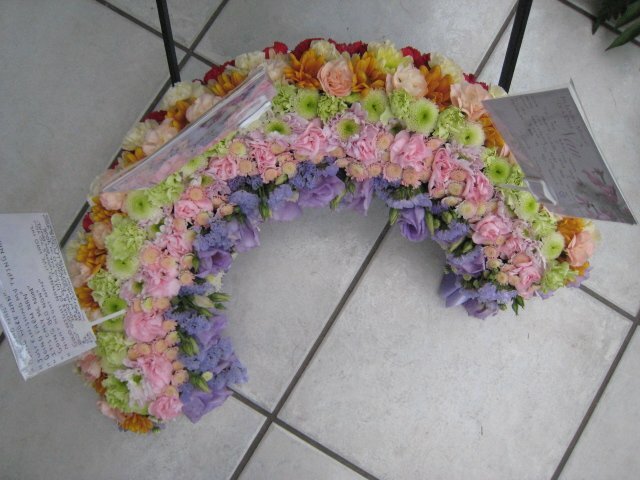 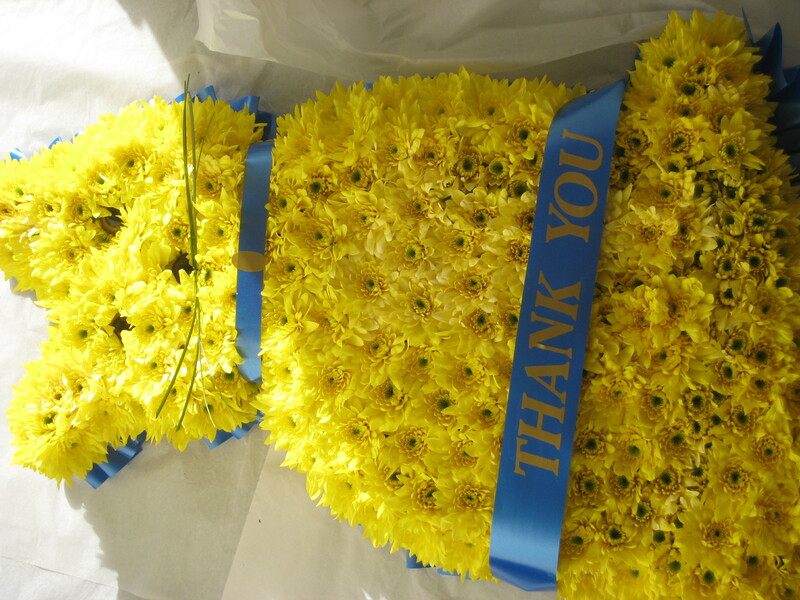 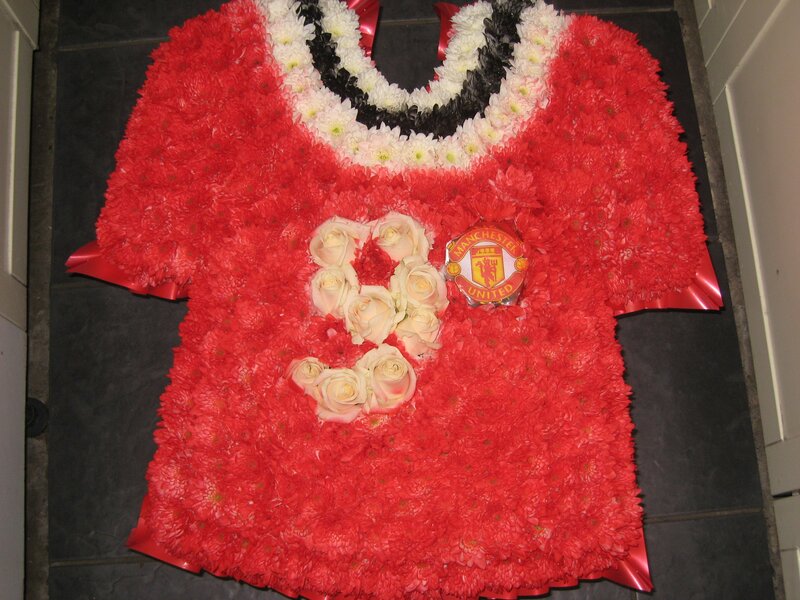 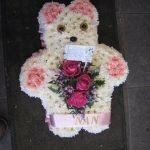 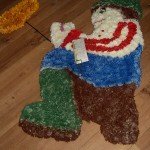 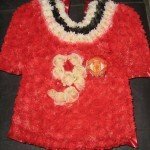 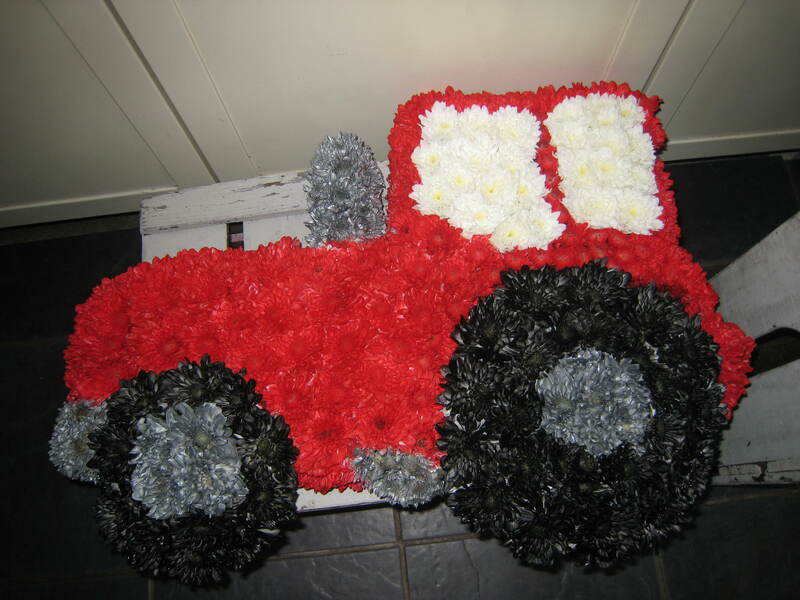 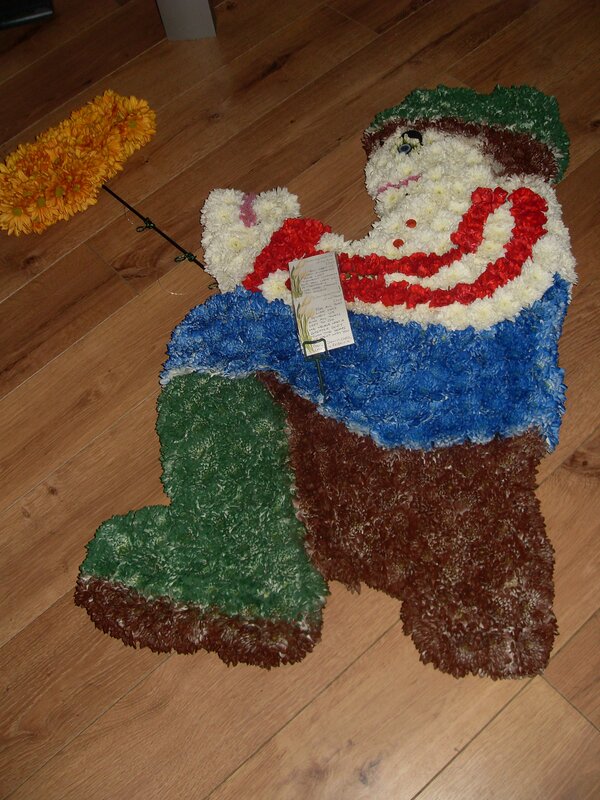 The same tribute but made with chrysanthemum, freesia, gypsy and carnations with a few roses. 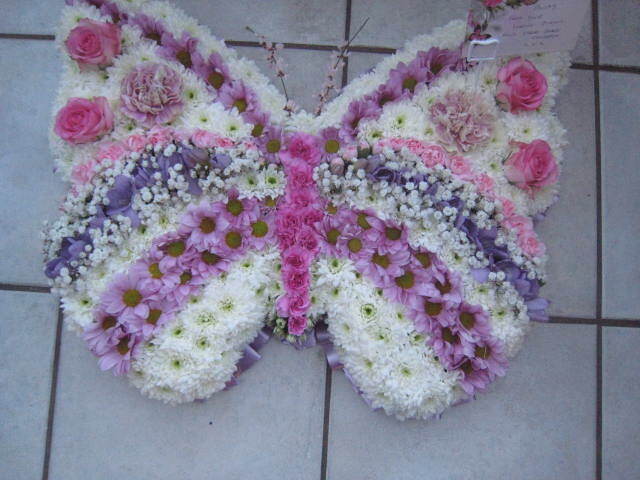 Lots of alternative colours and flowers are available for this design. 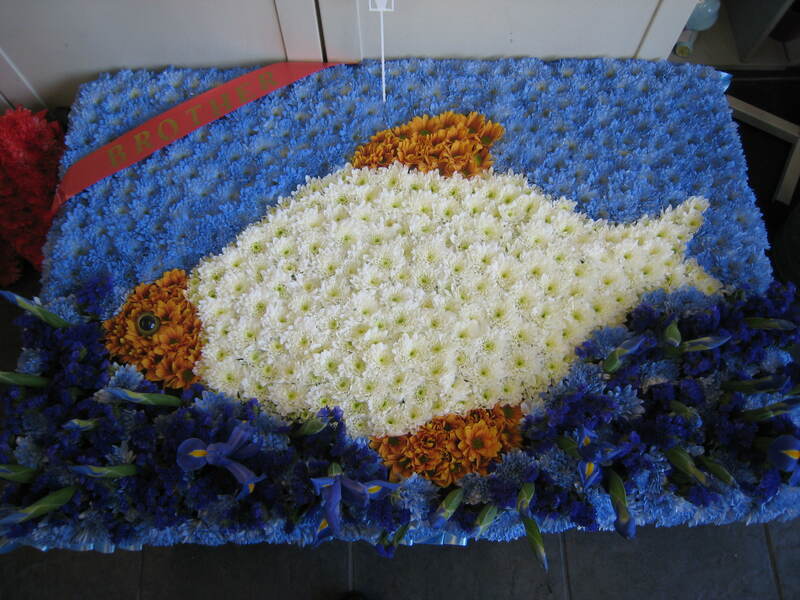 A 3D garden robin tribute sat on a nest of twigs. 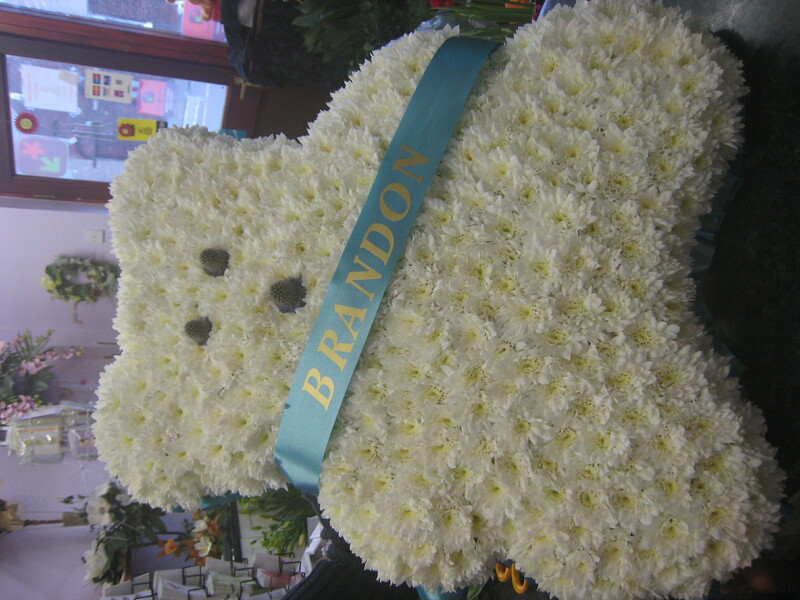 This was designed specially for one of our customers recently. 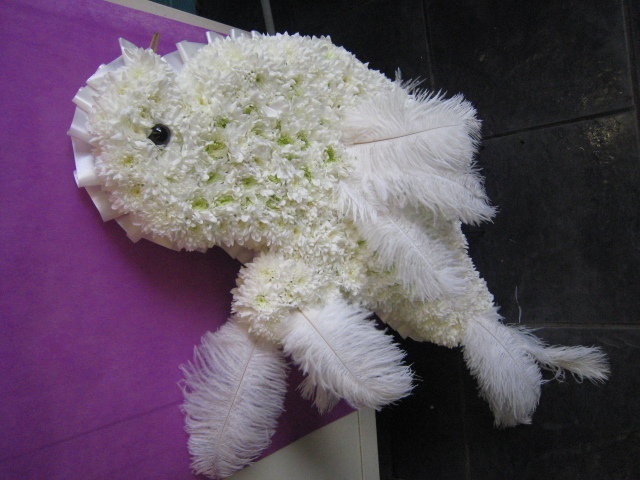 A large white dove made from white chrysanthemums and white feathers added to the design. 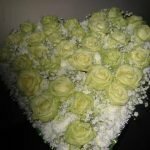 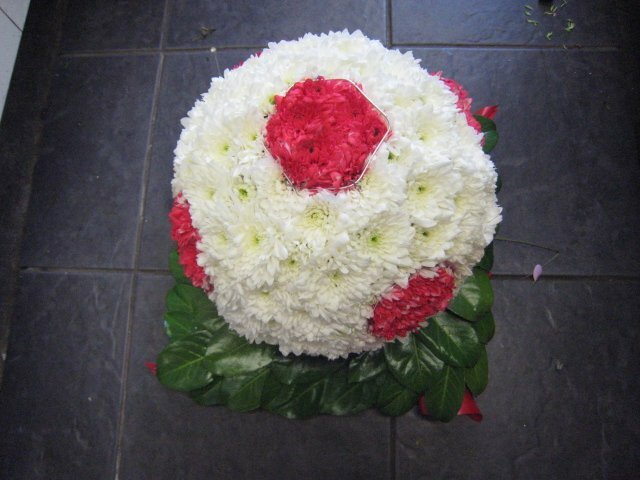 A large 21 inch heart filled with white chrysanthemum and roses. 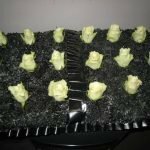 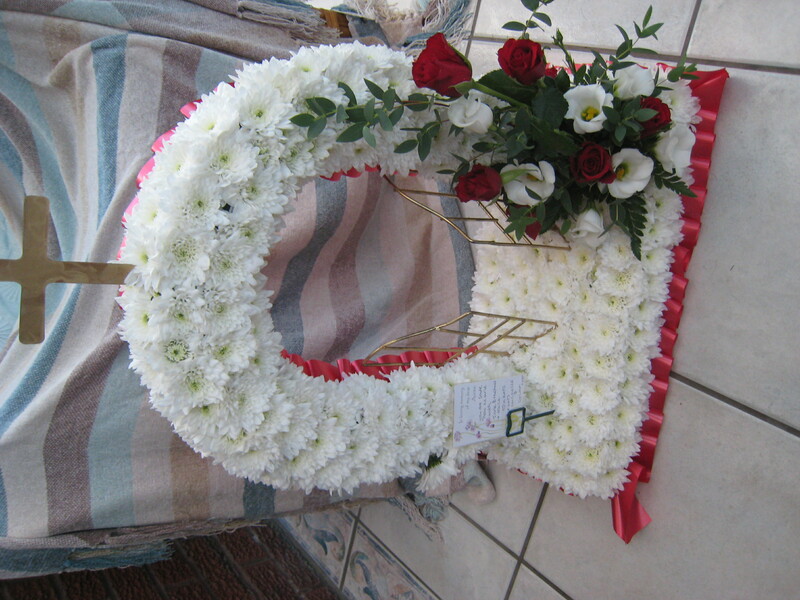 Other coloured roses can be used in this piece. 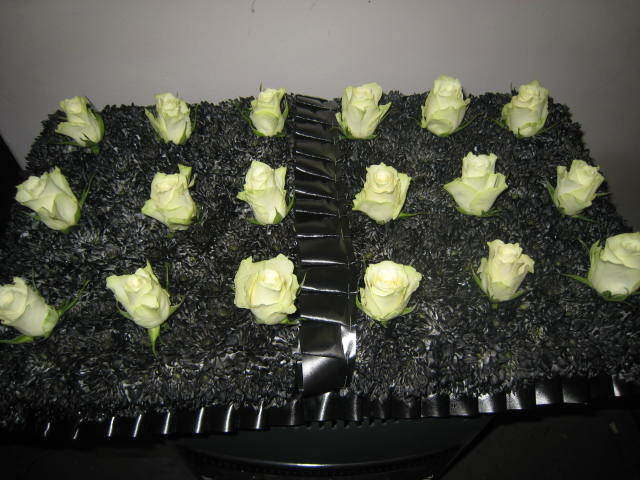 A domino with the double 9 in white roses. 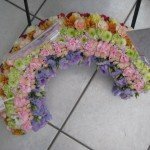 12 inch wide by 24 inch long. 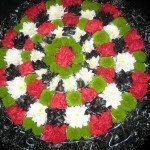 Any numbers can be made. 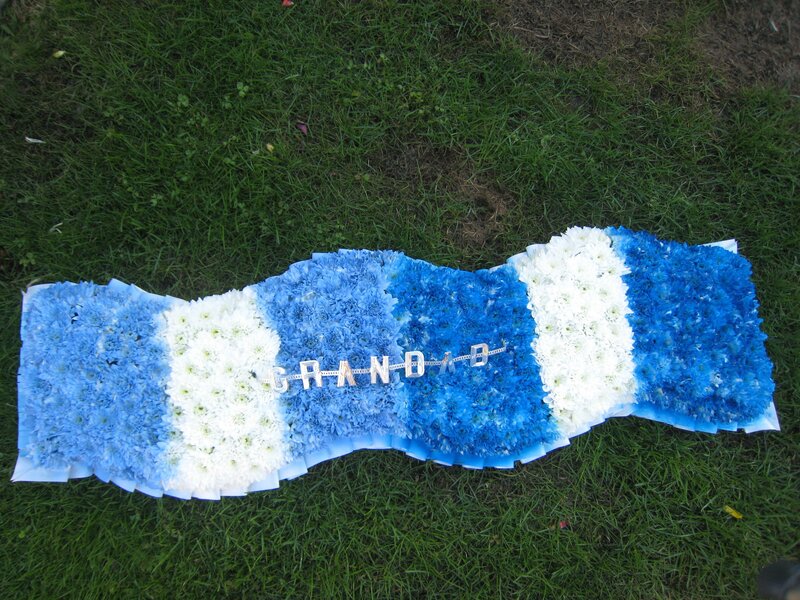 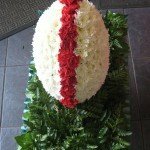 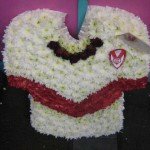 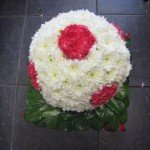 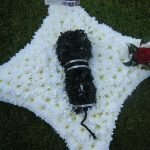 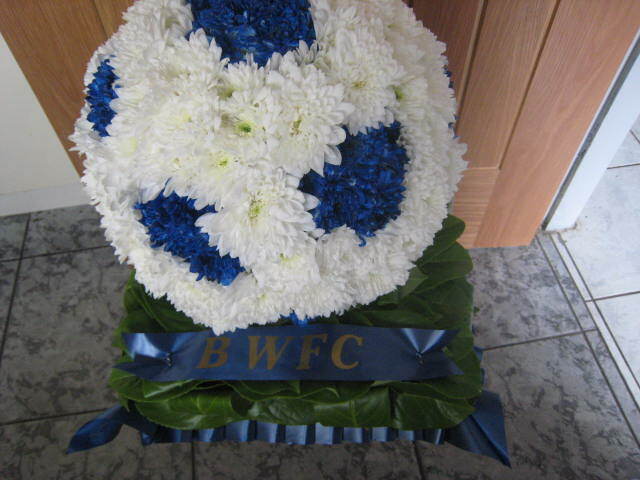 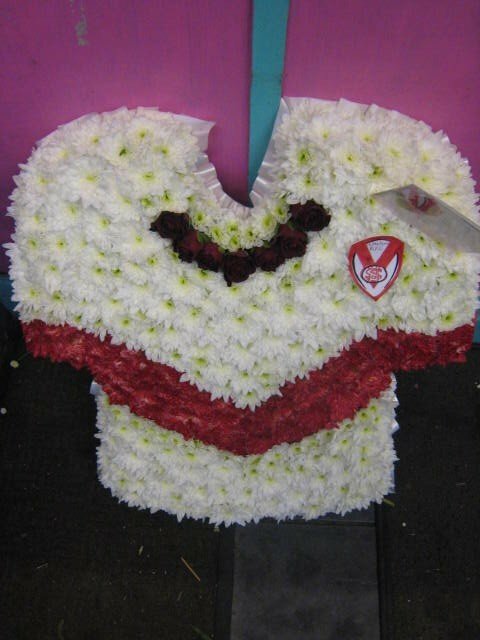 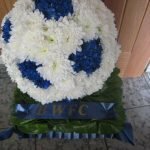 A Football Tribute made in white chrysanthemum with the diamonds sprayed in team colours based on a laurel foliage pitch. 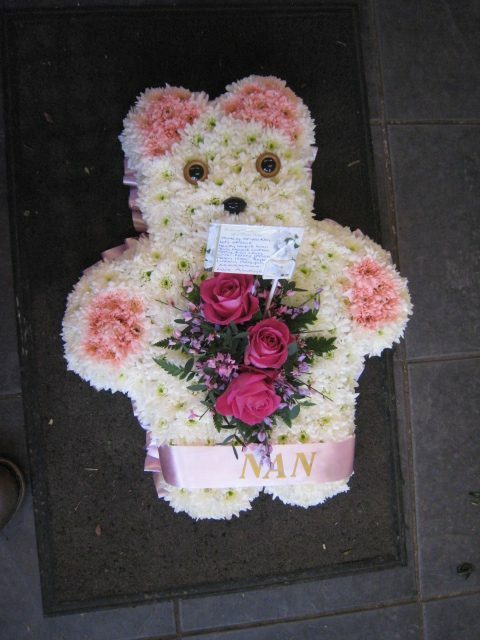 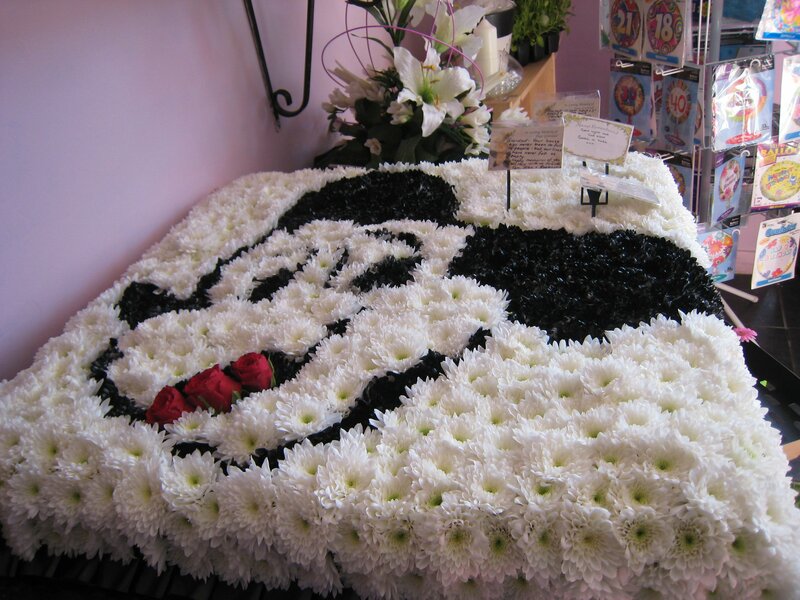 Suitable for a childs funeral. 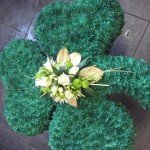 Can also be made in other colours. 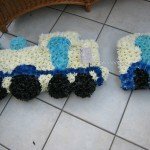 The Train is also available without the carriage. 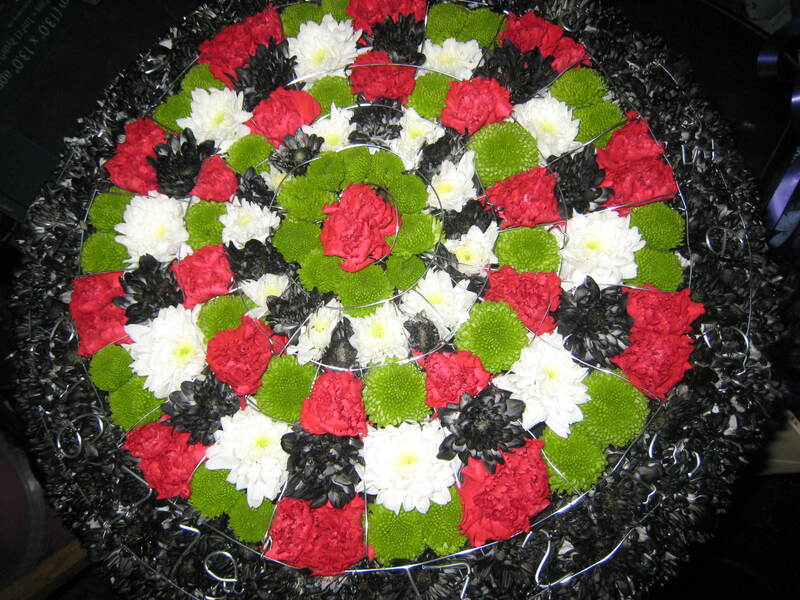 A dartboard tribute made in the traditional colours of the dartboard. 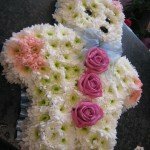 Can be made in 16 inch or 18 inch. 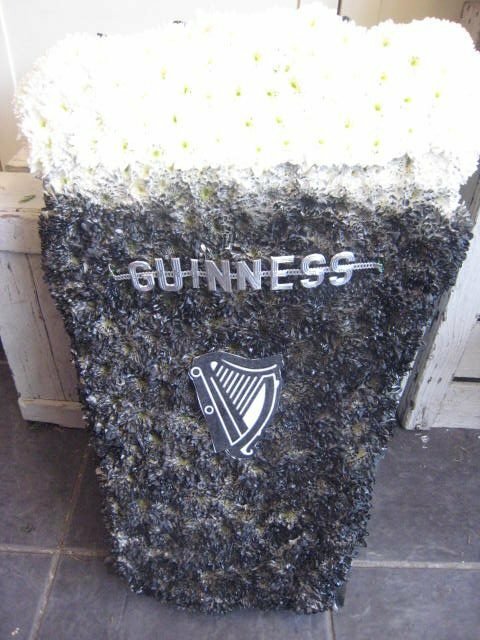 A pint glass shape filled with chrysanthemums sprayed black to look like Guinness. 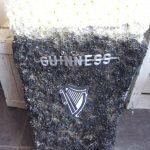 A Guinness symbol added to the design and the word Guinness in letters. 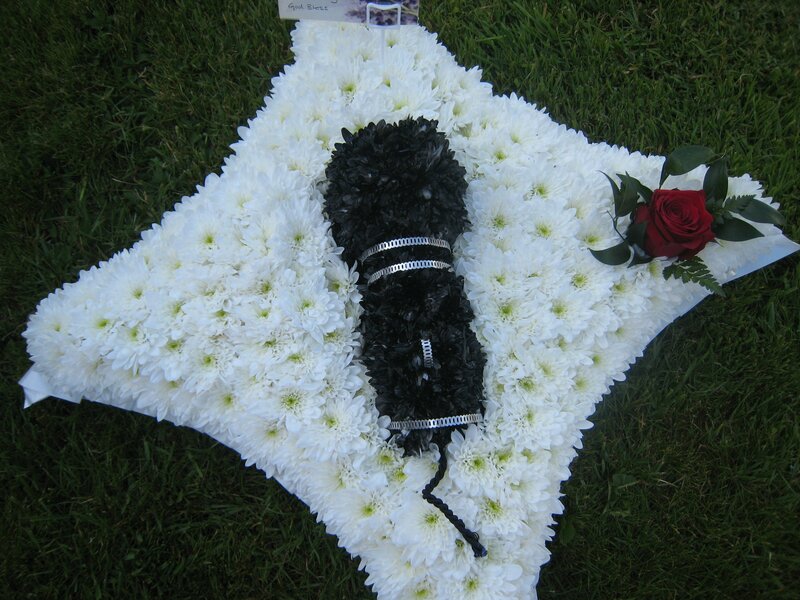 A base of white chrysanthemums with a black microphone in the centre and a single red rose in one corner. 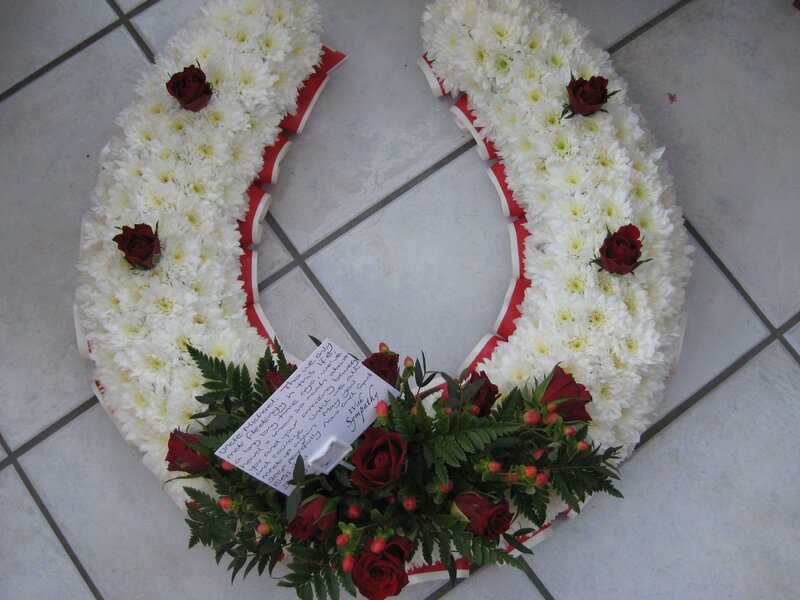 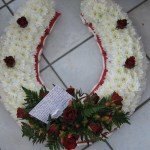 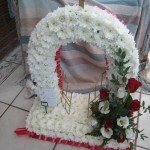 A Horseshoe tribute made in white chrysanthemums and red roses. 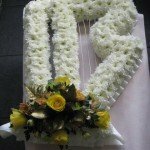 A ribbon banner can be added with any words. 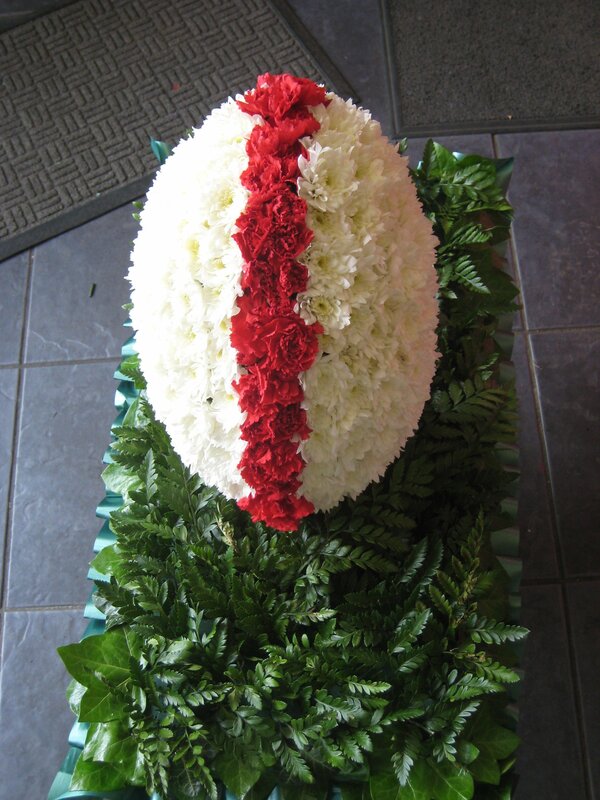 Made specially for my father in law who loved his bets! 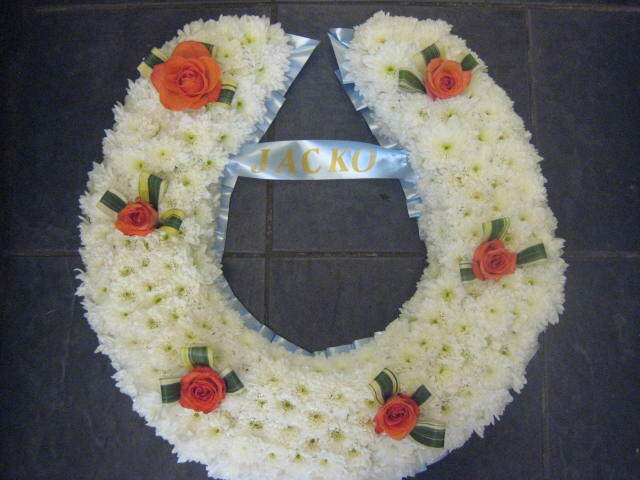 A ribbon with Jacko was inserted across the tribute as his grandchildren called him that. 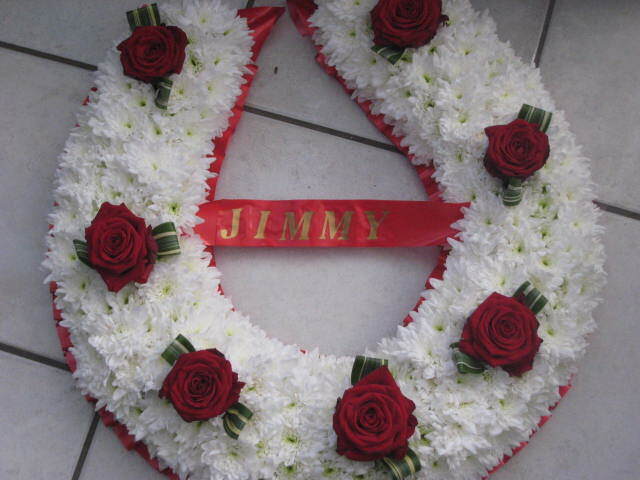 Any name can be added to any of our designs. 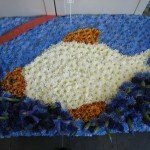 A fish tribute on a board with a ribbon banner. 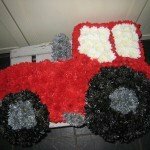 Can be made in other colours. 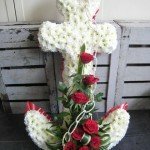 A Fisherman Tribute holding a rod with a fish. 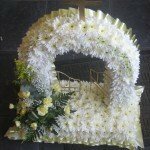 Can be made in other colours. 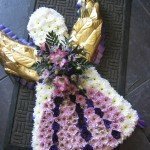 An Angel made from white and pink chrysanthemums with centre spray and gold wings. 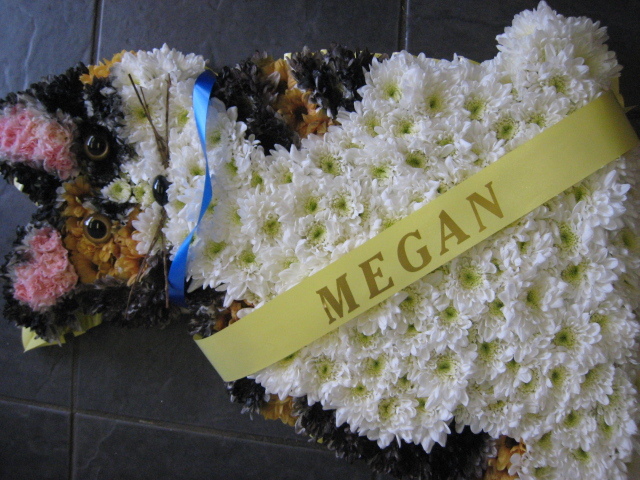 The cats were specially designed in specific colours for our customers but can be made in other colours. 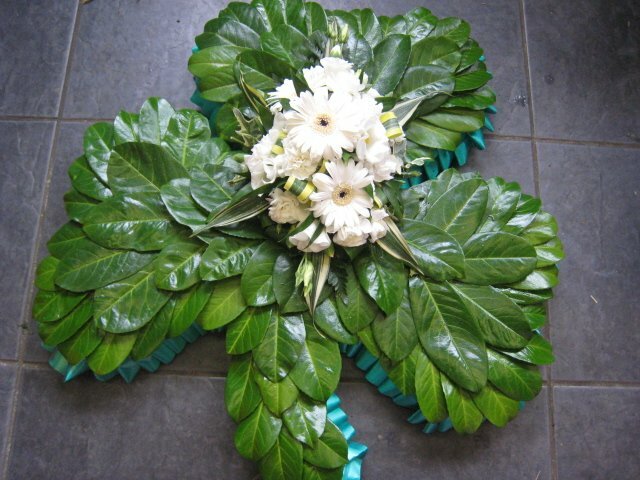 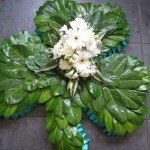 A shamrock made from chrysanthemum and sprayed green. 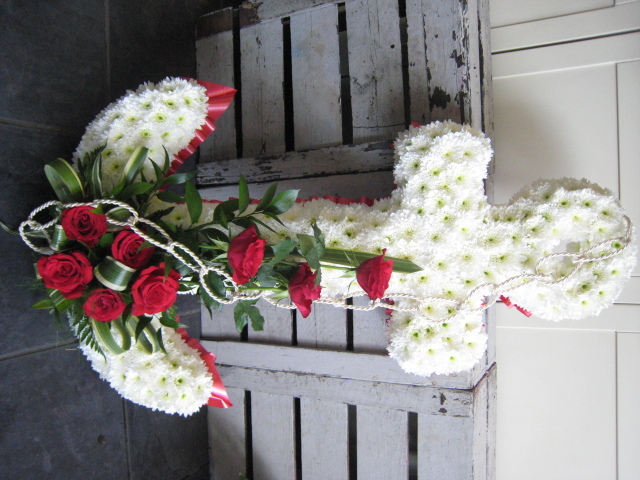 This was commisioned specially for someone who was in the merchant navy. 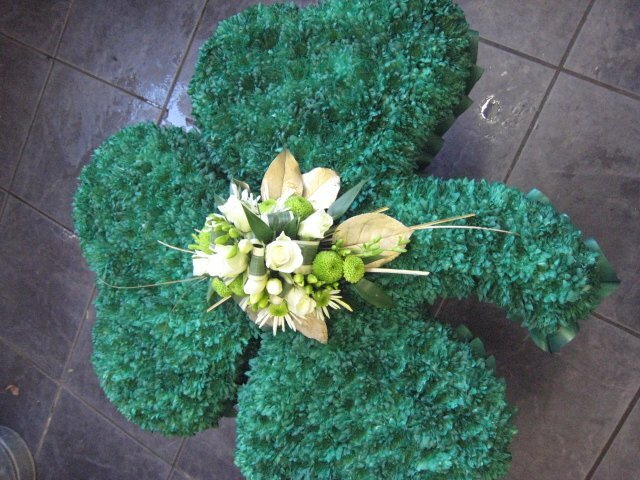 This is made from double chrysanthemums in white and a green and gold spray was added to the design. 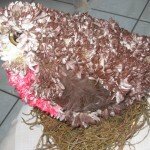 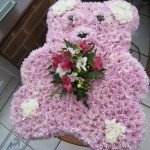 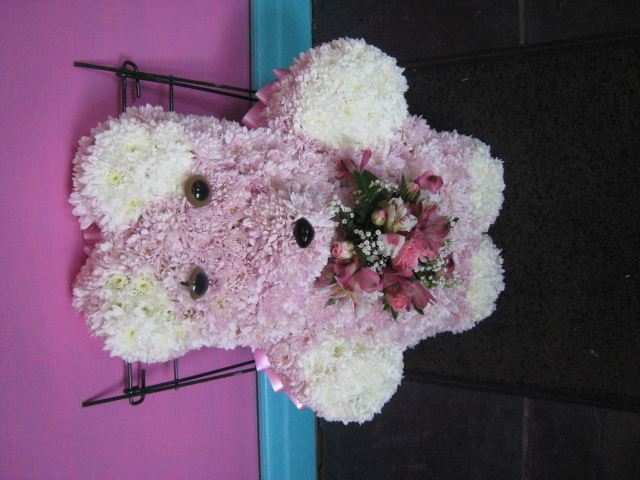 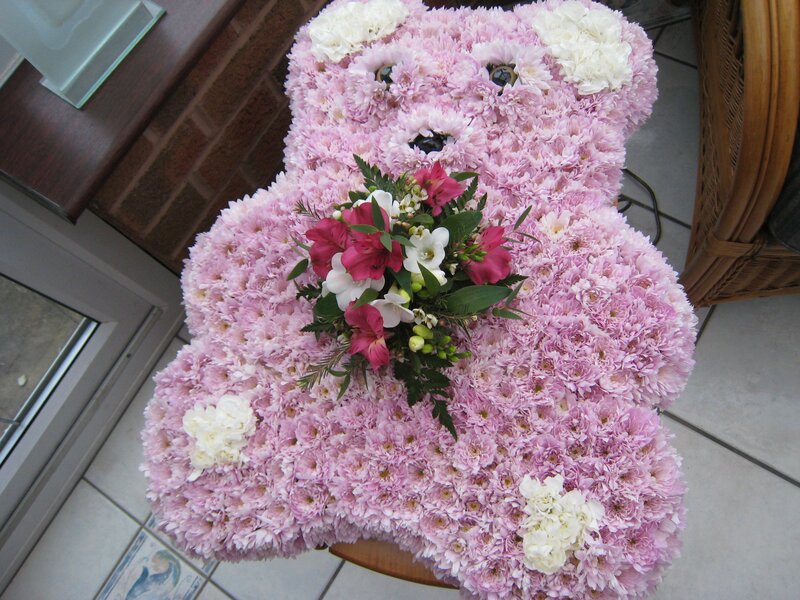 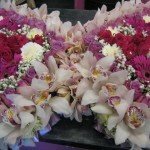 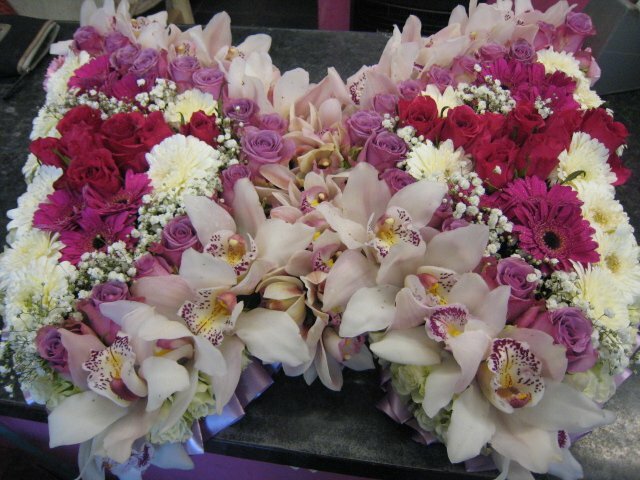 This was made using white double chrysanthemums with a centre spray of pink orchids. 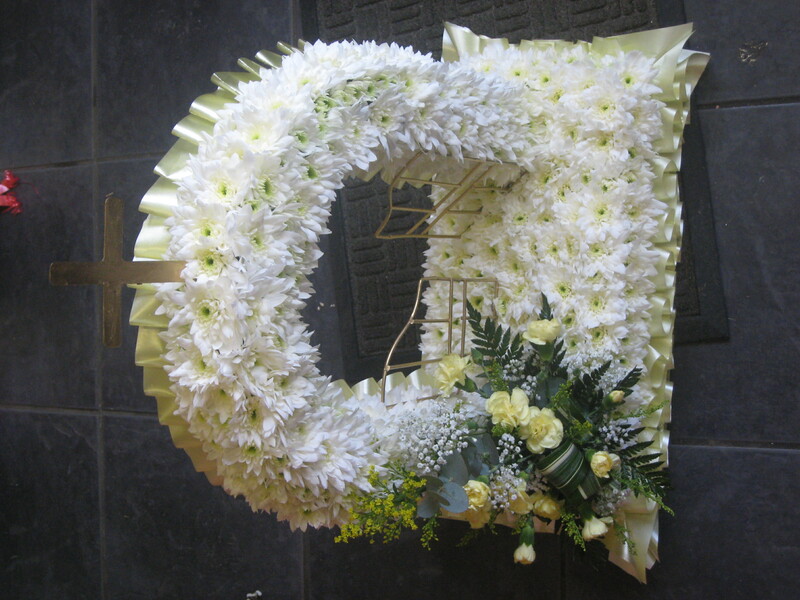 This was specially designed for our customer on a blank design board measuring 24 x 24 inches. 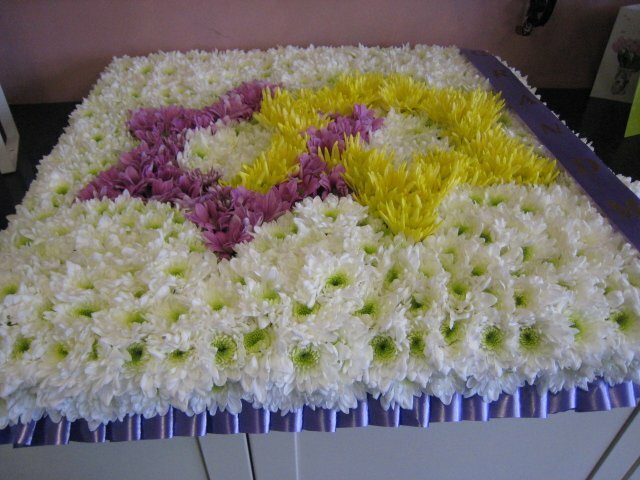 The stars were cut into the board and filled with pink and yellow chrysanthemums with the background in white. 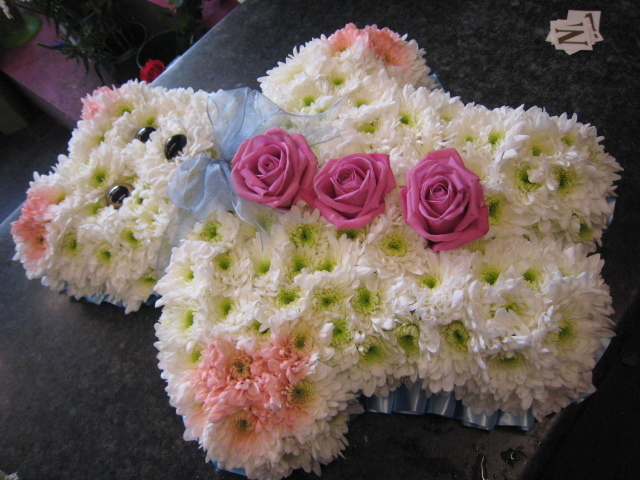 This was specially designed using pastel shades rather than bold colours. 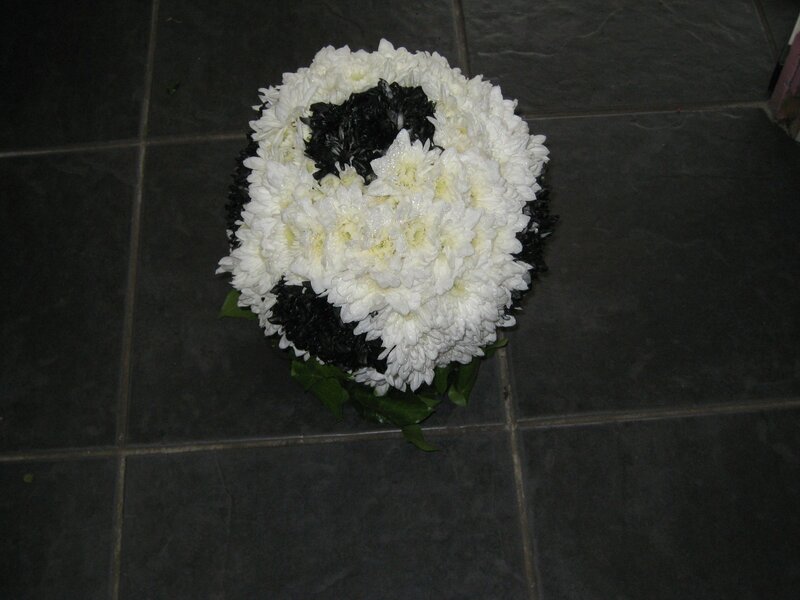 Lots of alternative flowers and colours available to your requirements. 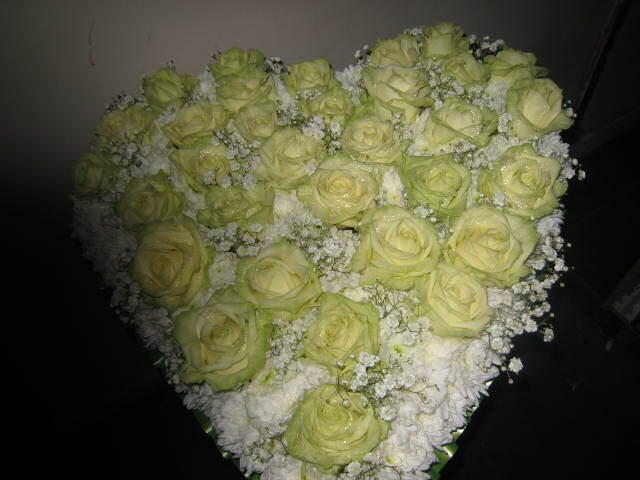 Three hearts on a frame. 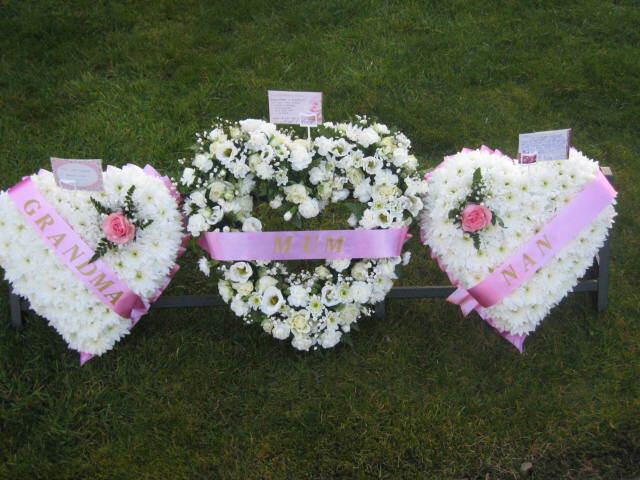 Two 13 inch filled hearts and a larger open heart with ribbon banners. 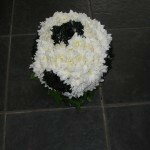 This design can be made in alternative colours.